PHOTO: KSA cheque presentation to the Waterloo Education Foundation (April 16, 2017 at the Titans game) to assist with the creation of a basketball tournament for local elementary school students. 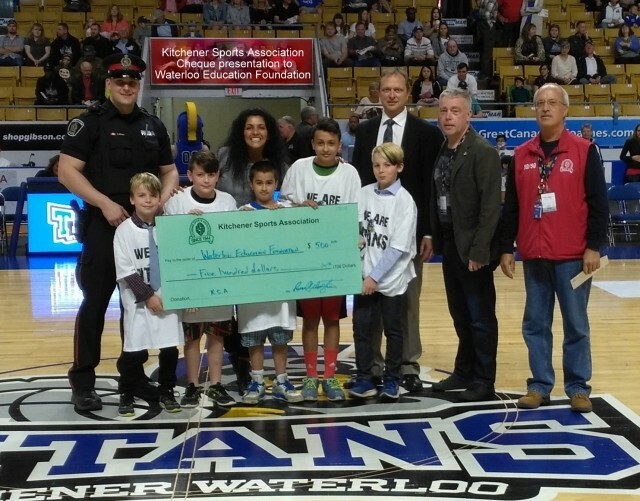 (BACK): Waterloo Region Police Constable, Katherine Katsambrokos (who arranged the tournament), Cameron Ball (representing the Titans), Titans official and Bernie Strauss (KSA Operating Committee) Front row, holding the presentation cheque, are some of the youth who participated in the tournament. January 24, 2017 A special 5:30 pm start for KSA night at the AUD for a KW Titans game. Before the game, attendees learned about Ben Fanelli's latest involvement with the EMPWR Foundation and Victus Academy, Tim Jackson and Mandy Bujold gave an update on the Region's bid to host the Canada Games in 2021 and urged everyone to get involved and show their supoort in whatever way possible. February 21, 2017: "safeTALK" Tana Nash, Executive Director of the Waterloo Region Suicide Prevention Council, emphasized that physical health is only half the story. We all need to be concerned about mental health. KSA decided to fund a safeTALK workshop for interested local minor sports groups. March 21, 2017: This was another early start (5:30 dinner) so attendees could complete the required training for safeTALK certification. Attendees learned about suicide prevention -- and there was lots of discussion as the topic hit close to home for everyone. April 18, 2017: Scholarship Awards Long distance runner and recent grad from Cornell University, Samuel Baxter (who also graduated from St. Mary's Highschool), was the evening's guest speaker. Eight local students received $1,500 scholarships from KSA! May 16, 2017: Athlete of the Year Dinner at Golf's Steakhouse Mark Schiefele, NHL palyer for the Winnipeg Jets, was named KW and area's Athlete of the Year for 2016. There were 7 other finalists for the honour. The evening also featured presentation of the KSA Awards of Excellence for 2017: Individual -- Bruce Young, Organization -- Waterloo Regional Boxing Academy, and Team -- Kitchener Panthers Minor Baseball Bantam Tier 1 Team . September 19, 2017: KSA's first dinner after the summer break featured Canadian sports author, Greg Oliver. Greg's presentation was full of anecdotes, supplimented with comments from Rod Seiling who was well acquainted with Father Bauer and was a key force on Team Canada in 1972. November 21, 2017: Our 29th annual Volunteer Recognition Dinner. After several cheque presentations (Fee-assistance and Athletic Excellence), 23 local minor sports groups took the opportunity to have one of their key volunteers recognized. Don Cameron MC'd the proceedings. .... and on to 2018!